Communities of city burghers created self-governing cities as a result of the city burghers’ struggles with sovereigns for cities’ rights and freedoms at first in Western Europe from the 11th century to the 13th century, and in Central Europe in the 13th and 14th centuries. The self-governing city burgher communities were legally separated from the state and received independence from the noble class. The development of these laws in cities was varied, and was different in each city. For example, cities in Northern and Central Italy (such as Venice and Genoa) joined a number lands under their control and became important centres and city-states. However most of these cities remained under the control of states and their rulers or landowners. Newcomers from German lands had an active role in creating self-ruling cities in Central and Eastern Europe, which is why from the Middle Ages, the most widespread self-governing laws for cities were the Magdeburg Rights (with the name coming from the city of Magdeburg in Germany), which developed in the 12th and 13th centuries. 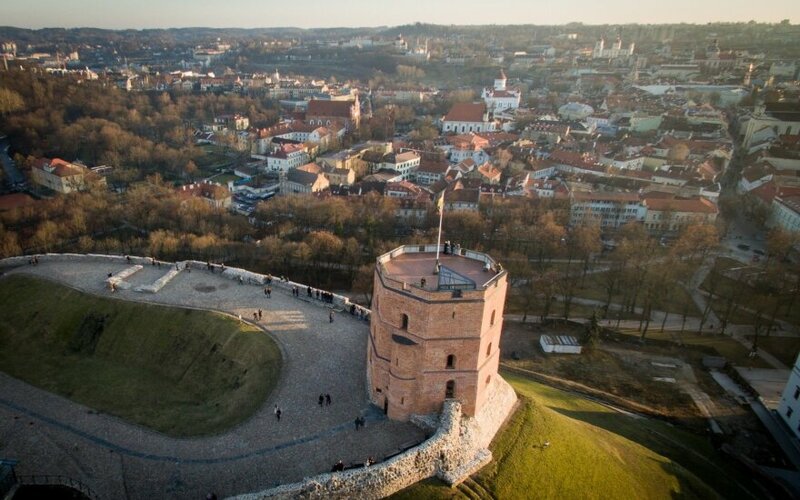 Cities of Lithuania breathe "free air"
The provision of self-rule to a city meant the gradual predominance of city laws that encompassed trade, family, rule and in general the entire life of the city. A city was separated from the castle, manor estate or monastery. Institutions of government (legal, administrative, financial as well as others) were created from the ranks of the city burghers. Though burghers paid taxes to the state, they received personal freedoms. What is known as the principle of "free air" was in force in such cities – after one lived in the city for a certain number of years (in the GDL, this number was from three to ten years), a person who was not free could become free, and he could not be returned to his former owner. A city burgher could practice his profession and take up trade without any obstructions. In privileges or legal acts adopted later, self-governing cities were given land for city burghers to live on, various land holdings, forests and the like. Trade exemptions were also provided, for example, various taxes were passed on to the cities, however they were released from obligations. Though the self-ruling cities made an autonomous state unit, the self-governance that was given to them was not limitless. Cities legally, and often in reality did not control all of its territory and inhabitants, and experienced the constant pressure of the nobles and the Church. However, the creation of self-governing cities was significant not only for the prosperity of the city burgher class, but it also strengthened the cities themselves, and allowed them to occupy an important position in the communities of the time. Self-governing cities came to Lithuania together with Christianity in 1387. Though GDL cities cooperated with Riga quite often, a city's rights had to go through Poland due to political circumstances. It was in Poland that the Magdeburg Laws were widespread, thus the self-rule given to GDL cities starting from the end of the 14th century was almost without exception based on the Magdeburg Laws. Culm Law was rarely adopted in the GDL. The cities that received the right to self-governance were called Magdeburg cities. Vilnius was the first GDL city that became acquainted with the Western type of self-rule. Though Klaipėda (then Memel) received rights to be a self-ruling city in 1257 or 1258, it belonged at the time to the Livonian Order and the development of its self-rule was a specific case, decided upon by the Order's laws, and later on by Prussian law. On March 22nd, 1387, the King of Poland and Grand Duke of Lithuania Jogaila gave Magdeburg rights to Vilnius in Merkinė, which later became an example for many other GDL cities. The rights foresaw the following: " [in order for] the status and condition of the city of Vilnius to become more favourable and better, for the city burghers and inhabitants themselves, and the entire community of our afore-mentioned city of Vilnius by the will of our royal highness we give and provide German law, which is called Magdeburg. (...) However, these same burghers and inhabitants, and the entire community of the aforementioned city of Vilnius must, as is usual, to faithfully obey all of our lawful and respected starostas of Vilnius that will be at the time. Also according to custom, which from time immemorial until the present has been followed and obeyed, having them protect our castle in Vilnius [all the way up] to the building of a brick wall with their own funds." This privilege, legally recognising the self-governing community of city burghers, was the beginning of great change in the development of the capital and other cities in Lithuania, and a huge part of reforms in the entire state. Though little was written about the average structure of cities in the first privilege of self-rule, there is no doubt that burghers of Vilnius who had received it (at the beginning German artisans and merchants) began to form a self-ruling body, and chose a city voigt and council. While there was not yet a tradition to legitimise a coat-of-arms for the city with a privilege, Vilnius began using a seal with the image of St. Christopher. In seals from the cities that have survived from the beginning of the 15th century, one can see an image of St. Christopher carrying baby Jesus through the water. In his right hand, he is holding a staff, with its top decorated with a double cross. These symbols are tied to the personal coat-of-arms of Jogaila, which later became the coat-of-arms for the Jagiellon dynasty. The first Magdeburg cities appeared around the turn of the 15th century. Soon after Vilnius received privileges for the right to self-rule, Brest received privileges (in 1390, and again in 1408), as did Grodno (1391) and Kaunas (1408). Trakai received self-rule before 1441, while Veliuona received them in 1443. German law expanded in Ruthenian cities as well: Lutsk (1432), Kremenets (1438), Slutsk (1441), Zhytomyr (1444), Kiev (1494/1497), Polotsk (1498, Minsk (1499) and Navahrudak (1511). In all, from 1387 to 1795 there were about 250 self-governing cities in the GDL. This was not much in comparison to the number of cities in total. However all larger cities of Lithuania were among those that had self-rule. With the development of prominent landowners, there were towns and cities in Lithuania that appeared on private lands as well as land of the church. The Radvilas (Radziwiłłs), Chodkevičiuses (Chodkiewiczes), Sapiegas (Sapiehas) and other nobles took great care to receive self-rule for their main cities, understanding their meaning for the growth of their cities. Thus in the 16th century such privileges were given to Biržai, Kėdainiai, Nesvizh, Slutsk and other private cities. With the Magdeburg privileges, rulers gave GDL cities the right to independently forge and keep ties with other cities using the same rights. They took care to mark their borders. This is why some cities (for example, Vilnius) were surrounded by brick defensive walls or had gates (for example Kaunas). The most important thing was that city burghers with Magdeburg privileges or later dalines received various tax, commercial, trade and other kinds of exemptions. A city independently took care of its trade and finances. Thus, the forming of the network of self-ruling cities in Lithuania was accompanied by the creation of a separate class of burghers, while the various exemptions given by rulers allows cities to become established. Z. Kiaupa, Литовские города между Русью и ареалом немецкого городского права в XIV–XV вв., Балты и Великое Княжество Литовское. Историко-лингвистический взгляд. Памяти Эгидиюса Банёниса, редколегия Е.Л. Назарова и др., Москва, 2007, с. 44–53; М. Макарау, Ад пасада да магдэбургii, прававое становiща насельнiцтва местау Беларускага Падзвiння у XIV-першай палове XVII ст., Мiнск, 2008. What did burghers wear in Medieval Lithuania?